Emerald (Be3Al2(SiO3)6) is a variety of the mineral beryl, coloured green by trace amounts of chromium and sometimes vanadium. Beryl has a hardness of 7.5 - 8 on the 10 point Mohs scale of hardness. The origin of the word "Emerald" is said to be a Sanskrit word meaning green". Emeralds come in many shades of green and bluish green. There is a wide spectrum of clarity, dependent on the inclusions and fractures in the crystal. Clear stones with dark yet vibrant colour command the highest prices.Emeralds in antiquity were mined by the Egyptians and in Austria, as well as Swat in northern Pakistan. Colombian emeralds are generally the most prized due to their transparency and fire. Some of the most rare emeralds come from three main emerald mining areas in Colombia: Muzo, Coscuez, and Chivor. Fine emeralds are also found in other countries, such as Zambia, Brazil, Zimbabwe, Madagascar, Pakistan, India, Afghanistan and Russia. Emerald is May's birthstone. Emerald is among the most revered and expensive of all gemstones. Emeralds exhibit the most beautiful, intense and radiant green. Top quality, fine emeralds are sometimes even more valuable than diamonds. Even for a skilled gem cutter, cutting emeralds presents a special challenge because of the high value of the raw crystals and the frequent inclusions. Indeed, a special cut was developed just for this gem: the "Emerald Cut". The clear design of this rectangular or square cut with its bevelled corners brings out the beauty of this valuable gemstone to the full, at the same time protecting it from mechanical strain. The value of an emerald depends on cut, colour, clarity, and carat. The characteristics of Colombian emeralds set the highest standards of quality. Where you will to find our "antique jewellery and vintage jewellery collection". You will discover Antique Emeralds, Antique Emerald rings, Vintage Emerald rings, Emerald & Diamond rings plus Vintage Emerald jewellery, Antique emerald jewellery plus secondhand emerald rings. Sapphire refers to gem varieties of the mineral corundum, an aluminium oxide (Al2O3), when it is a colour other than red. It can be found naturally or manufactured in large crystal boules for varied applications, including infrared optical components, watch faces, high-durability windows, and wafers for the deposition of semiconductors such as GaN nanorods.The mineral corundum consists of pure aluminium oxide. Trace amounts of other elements such as iron, titanium and chromium give corundum their blue, yellow, pink, purple, orange or greenish color. Sapphire includes any gemstone quality varieties of the mineral corundum except the fully saturated red variety, which is instead known as ruby, and the pinkish-orange variety known as padparadscha. Natural sapphire - Although blue is considered the normal colour for sapphires, they can be found across a full range of spectral colors as well as brown, colorless, grey and black. Those other than blue in colour are considered fancy color sapphires. Some natural sapphires can be found as completely transparent, or "white." White sapphires usually come out of the ground as light grey or brown and are then heated to make them clear. However, in very rare circumstances they will be found in a clear state. Various shades of blue [dark and light] result from titanium and iron substitutions in the aluminium oxide crystal lattice. Some stones are not well saturated and show tones of gray. 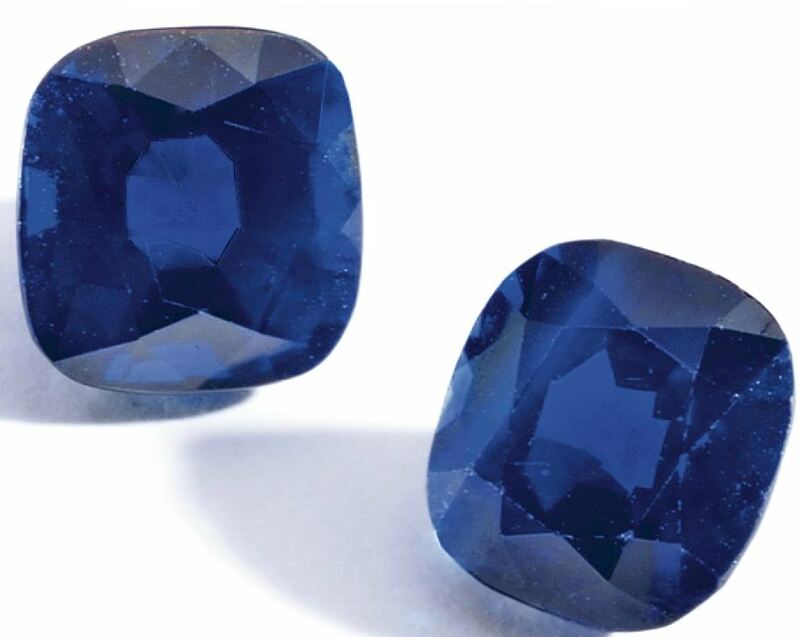 It is common practice to bake natural sapphires to improve or enhance color. This is usually done by heating the sapphires to temperatures of up to 1800 °C for several hours, or by heating in a nitrogen deficient atmosphere oven for seven days or more. On magnification, the silk due to included rutile needles are often visible. If the needles are unbroken, then the stone was not heated; if the silk is not visible then the stone was heated adequately. If the silk is partially broken, then a process known as low tube heat may have been used. Low tube heat is the process whereby the rough stone is heated to 1300 °C over charcoal for 20 to 30 minutes. This removes gray or brown in the stone and improves colour saturation. Purple sapphires are lower in price than blue ones. These stones contain the trace element vanadium and come in a variety of shades. Yellow sapphires and green sapphires have traces of iron that gives them their colour. Pink sapphires have a trace of the element chromium and the deeper the color pink the higher their monetary value as long as the color is going toward the red of rubies. Sapphires also occur in shades of orange and brown, and colourless sapphires are sometimes used as diamond substitutes in jewelry. Salmon-colour padparadscha sapphires are orangy-pink, pinkish-orange or pink-orange in color, which often fetch higher prices than many of even the finest blue sapphires. The word 'padparadscha' is Sinhalese for 'lotus flower'. Recently many sapphires of this colour have appeared on the market as a result of a new treatment method called "bulk diffusion". Colour shift sapphires are blue in outdoor light and purple under [incandescent] indoor light. Colour changes may also be pink in daylight to greenish under fluorescent light. Some stones shift color well and others only partially, in that some stones go from blue to bluish purple. Such colour-change sapphires are widely sold as "lab" or "synthetic" alexandrite, which is accurately called an alexandrite simulant (also called alexandrium) since the latter is actually a type of chrysoberyl---an entirely different substance whose pleochroism is different and much more pronounced than color-change corundum sapphire). The 182 carat (36.4 g) Star of Bombay, housed in the National Museum of Natural History, Washington D.C., is a good example of a blue star sapphire.A star sapphire is a type of sapphire that exhibits a star-like phenomenon known as asterism. Star sapphires contain intersecting needle-like inclusions (often the mineral rutile, a mineral composed primarily of titanium dioxide ) that cause the appearance of a six-rayed 'star'-shaped pattern when viewed with a single overhead light source. The value of a star sapphire depends not only on the carat weight of the stone but also the body colour, visibility and intensity of the asterism. According to Rebbenu Bachya, and many English Bible translations, the word Sapir in the verse Exodus 28:18 means Sapphire and was the stone on the Ephod representing the tribe of Issachar. However, this is extremely disputed as though it is true that the English word sapphire derives from the Hebrew sapir (via Greek sapphiros), Sapphires were actually not really known about before the Roman Empire (and were initially considered to be forms of jacinth, rather than deserving of a word to themselves), and prior to that time sapphiros referred to blue gems in general. It is thought by scholars that the sapphire of the Bible was actually lapis lazuli - which was frequently sent as a gift between middle-eastern nations in Biblical times (Texas Natural Science Center, 2006). There is a wide range of views among traditional sources about which tribe the stone refers to. Blue sapphire is associated with Saturn (Wojtilla, 1973), yellow sapphire with Jupiter in Vedic astrology. It is understood that word Sapphire seems to be a corrupted form of Sanipriya(Sanskrit:- Sani=Saturn, Priya= Beloved). Buddhist monks who moved to Middle East introduced the Stone as Sani piriya and eventually become sapir and sapphire. Sapphire is the birthstone associated with September. The 45th wedding anniversary is known as the sapphire anniversary. Sapphires are one of the four most valued stones. The other highly valued stones are rubies (sapphires that are red, caused by chromium impurities), emeralds, and diamonds. Sapphire City is the capital of the Munchkin Country in The Giant Horse of Oz. Ruby is a light pink to blood red gemstone, a variety of the mineral corundum (aluminium oxide). The common red colour is caused mainly by the element chromium. Its name comes from ruber, Latin for red. Other varieties of gem-quality corundum are called sapphires. It is considered one of the four precious stones, together with the sapphire, the emerald and the diamond. Improvements used include color alteration, improving transparency by dissolving rutile inclusions, healing of fractures (cracks) or even completely filling them. Prices of rubies are primarily determined by colour (the brightest and best "red" called Pigeon Blood Red, command a huge premium over other rubies of similar quality). After colour follows clarity: similar to diamonds, a clear stone will command a premium, but a ruby without any needle-like rutile inclusions will indicate the stone has been treated one way or another. Cut and carat (size) also determine the price. Rubies have a hardness of 9.0 on the Mohs scale of mineral hardness. Among the natural gems only diamond is harder (Mohs 10.0 by definition). All natural rubies have imperfections in them, including color impurities and inclusions of rutile needles known as "silk". Gemologists use these needle inclusions found in natural rubies to distinguish them from synthetics, simulants, or substitutes. Usually the rough stone is heated before cutting. Almost all rubies today are treated in some form (of which heat treatment is the most common practice), and rubies which are completely untreated and still of excellent quality command a large premium. Some rubies show a 3-point or 6-point asterism or star. These rubies are cut into cabochons to display the effect properly. Asterisms are best visible with a single-light source, and move across the stone as the light moves or the stone is rotated. Such effects occur when light is reflected off the silk (the structurally oriented rutile needle inclusions) in a certain way. This is one example where inclusions increase the value of a gemstone. Rubies can furthermore show colour changes - though this occurs very rarely - and chatoyancy. Rubies are mined in Myanmar (Burma), Thailand, Sri Lanka, Tanzania, Kenya, Madagascar, and Cambodia, but they have also been found in the U.S. states of Montana, North Carolina and South Carolina. The Mogok Valley in Upper Myanmar has produced some of the finest rubies, but in recent years very few good rubies have been found there. The unique colour in Myanmar (Burmese) rubies is described as "pigeon's blood". They are known in the trade as "Mogok" rubies. In central Myanmar the area of Mong Hsu also produces rubies. The latest ruby deposit to be found in Myanmar is situated in Nam Ya. In 2002 rubies were found in the Waseges River area of Kenya. Sometimes spinels are found along with rubies in the same rocks and are mistaken for rubies. However, fine red spinels may approach the average ruby in value. Although pieces of red corundum can be found weighing many kilograms, they are generally not of sufficient quality to be valuable as gemstones. For this reason, auction prices are the best indicator of a stone's true value, and prices do not necessarily correlate with size. As of 2006, the record price paid at auction for a single ruby stone was $5,860,000 for an unnamed 38.12 carat cabochon cut ruby. According to Rebbenu Bachya, and the New International Version, the word odem means "ruby" in the verse Exodus 28:17 (referring to a stone on the Hoshen), and was the stone representing the tribe of Reuben. Modern Hebrew has taken this meaning. However, odem actually means earth, and is cognate with Adam; in the Middle East, the earth it refers to is certainly reddish, but the Septuagint translates the term as Sard (which also means red), which is also the name of a common, somewhat opaque, gem. Scholars think the stone intended is probably a Sard, as does the King James Version, scholars think that if not a Sard it may possibly be the related gem carnelian; it is thought possible that Sard and Odem here just mean the colour of the stone, and red Jasper would therefore also be a possibility. Ruby is the most commonly named precious stone in English translations of the Bible; an example being Proverbs 31: "A virtuous wife is worth more than rubies.". The underlying masoretic text doesn't necessarily refer to rubies, however. Not only are there issues such as that mentioned with odem, but in the case of Proverbs 31, the masoretic text merely states jewels, and the Septuagint makes Proverbs 31 refer to precious stones (estin lithon ); some English versions of the bible believe that pearls is a better translation here. The famous lighted "Red Stars" mounted above Kremlin spires, thought to be giant rubies mined in Siberia, are coloured glass. Ruby is the birthstone associated with July and of the zodiac sign Leo and Cancer. Ruby is associated with the Sun in Vedic astrology. Ruby is associated with a 40th wedding anniversary or 40th anniversary. Rubies have always been held in high esteem in Asian countries. They were used to ornament armor, scabbards, and harnesses of noblemen in India and China. Rubies were laid beneath the foundation of buildings to secure good fortune to the structure.